This week we are highlighting a historic pair of gauntlet gloves that are said to have belonged to King Charles I, left behind after a Royal visit to an aristocratic family in Derbyshire in the 1630s. These beautifully worked gloves are on the move again, some 370 years later, as they have recently travelled to Australia to take pride of place alongside other Royal gloves on loan from the Glove Collection of the Worshipful Company of Glovers of London to an exhibition of Royal portraiture From Tudors to Windsors, which has just opened at Bendigo Art Gallery. These are gauntlet gloves, gloves with an extended cuff coming well up over the wrist, and which is roughly triangular in shape. Each gauntlet glove measures 34cm in length and 10cm in width, across the knuckle and is made of light brown doeskin leather dressed on the flesh side to give a sueded finish. The gloves are embroidered in fine silver gilt wire thread in an abstract design round the gauntlet, on the back of the hand, at the base of the thumb and along the finger and thumb seams. 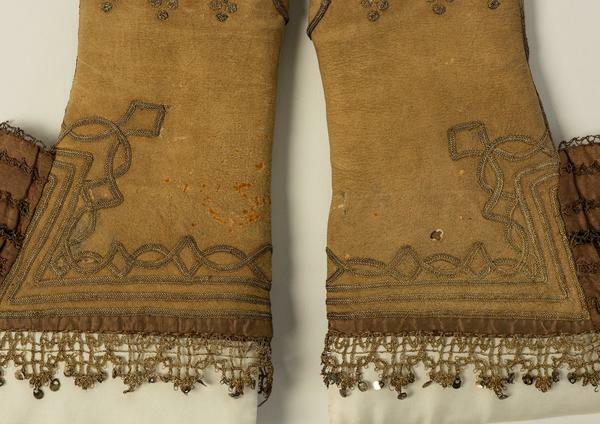 The top edges are trimmed with silver gilt bobbin lace with silver gilt spangles, and the side ribbons are also trimmed with narrow strips of silver gilt lace. Each glove is inscribed on the inside in ink: ‘Gloves of King Charles I. W.B. Redfern’s Collection’. 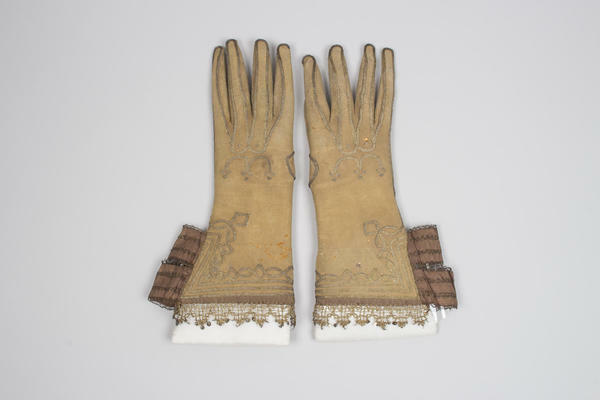 The gloves were purchased at auction at Christies South Kensington for the Glove Collection of the Worshipful Company of Glovers on 16 February 1988. Originally in the possession of the Milward Family of Uttoxeter in Staffordshire in England, the story goes that King Charles I left these gauntlet gloves, plus one other pair, behind after a visit to Sir Thomas Milward of Eaton Dovedale in Derbyshire. The King is known to have visited Eaton Dovedale on more than one occasion. (Sir Thomas died in 1658 and his will, dated one year later, is now in the National Archives at Kew). 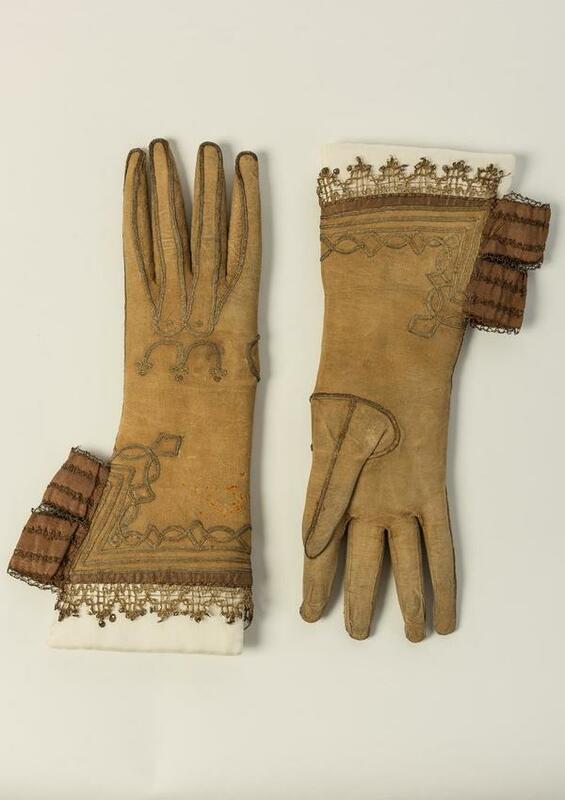 Eventually, the Charles I gloves came into the possession of collector W. B. Redfern, and he included them in his book of photographs and “carefully made water-colour drawings” Royal and Historic Gloves and Shoes published by Methuen & Co, London in 1904. Redfern was sure that the gloves did belong to Charles I: “There is a Van-Dykish look about these gloves, which assists the belief that they belonged to the martyr King”. While we may never know, or have proof of a definite Royal provenance, these gauntlet gloves are of the right date and quality to have an association with King Charles I. They certainly make a wonderful display feature alongside so many Royal figures, many of whom are shown wearing or holding gloves! 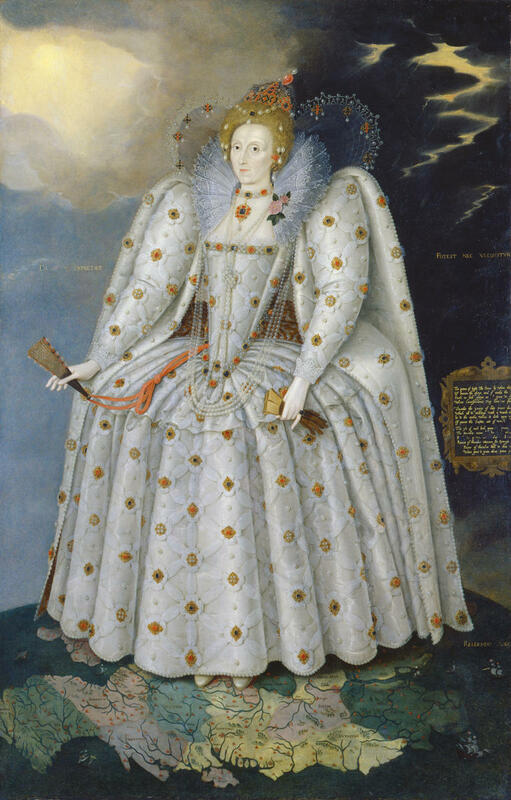 Image: Queen Elizabeth I (‘The Ditchley’ portrait) By Marcus Gheeraerts the Younger ca. 1592, © National Portrait Gallery , London. Tudors to Windsors traces the history of the British monarchy through the outstanding collection of the National Portrait Gallery, London, and over 200 works have travelled out to Australia. Presenting some of the most significant royal portraits, the exhibition explores five royal dynasties: the Tudors, the Stuarts, the Georgians, the Victorians and the Windsors, shedding light on key figures and important historical moments. 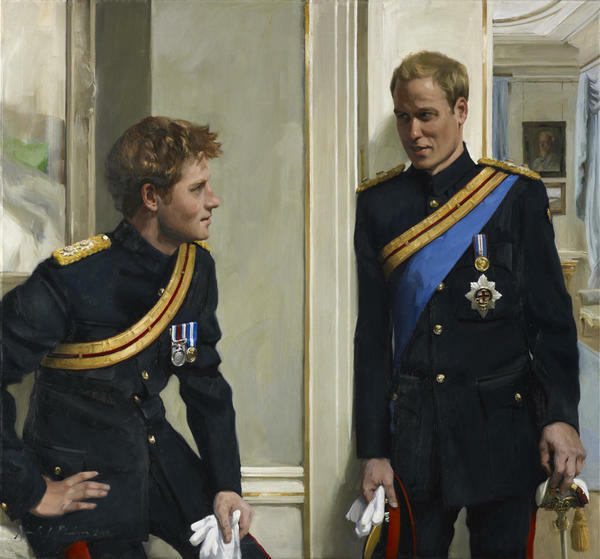 Image: Prince William (later Duke of Cambridge), and Prince Harry (later Duke of Sussex) By Nicola Jane (Nicky) Philipps, 2009 © National Portrait Gallery, London. To bring these royal figures to life, Bendigo Art Gallery has secured key loans of historic fashion, armour and personal effects, including this magnificent pair of Charles I gloves, part of the Glove Collection of the Worshipful Company of Glovers of London. Are you in Australia or do you plan to visit the Tudors to Windsors exhibition, which is on display at Bendigo Art Gallery until 16 July 2019? 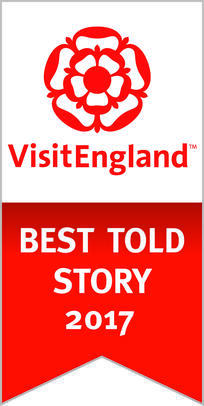 If so, please do get in touch at [email protected] with news of your visit – we’d love to know what you think of the Charles I gloves on display! The Charles I gloves return to Bath from Australia in July 2019 and will then be on display as part of Glove Stories.